If you’re still thinking of what to get mom for her big day, maybe she needs exercise. If you’re “lucky” enough to be in Vermont, maybe you can send her outside to shovel snow. That will get her heart racing. And it will get your mom demanding you buy her a condo in Florida. 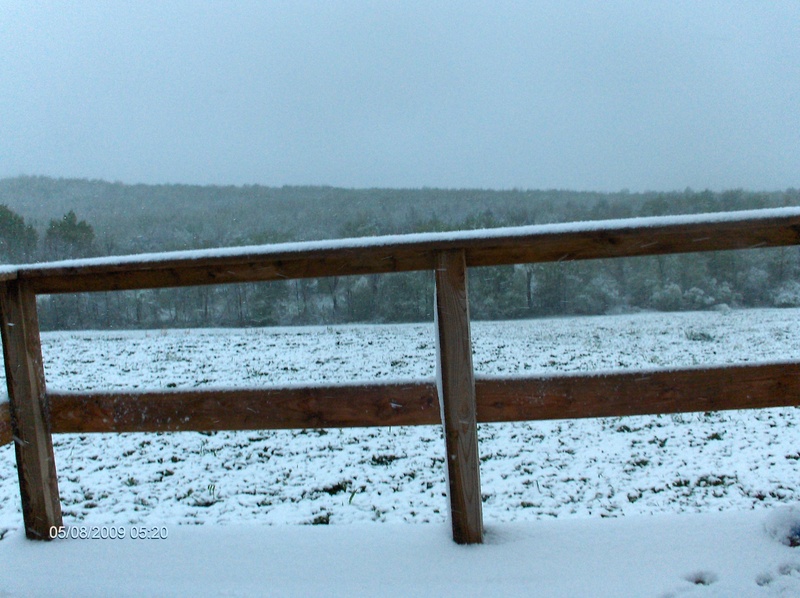 Yep, it’s snowing in Vermont again. Picture is from my friends Al and Mike in Enosburg this morning.It’s their back yard. Not good. I’m looking out my St. Albans window at 6:30 a.m., the leaves are in full summer greenery and snow is slashing their way through them. The wind is screaming! Probably 30 mph from the northwest. There were nicer mornings than this in January. At least this time it’s not really piling up; just a dusting on the truck roof. What a strange spring. Ninety percent of the time, it’s been strangely warm. But we get these strange strong winter interludes, like the 16 inches of snow a week and a half ago, and now this. I have indoor work to do this morning, which is good. This afternoon, I have to mow a large lawn in a high spot in Richmond. The snow better melt by then. It’s going to be a cold job, though. Strange to mow in the snow, but that’s Vermont. The worst part of this new cold wave is coming Monday night. It’s supposed to be in the 20s then. The apple orchards are blooming. Anything under 28 degrees kills them. Will we have apples this fall? Strawberries this June? Suddenly, that’s in doubt. Vermont’s climate can be punishing. But, I’ll just look forward to spring’s return, hopefully within a week. This entry was posted on May 9, 2010 at 10:45 am and is filed under Uncategorized. You can follow any responses to this entry through the RSS 2.0 feed. You can leave a response, or trackback from your own site.